Watercolor on archival rag paper, 6" x 6"
During the cold months I've been closing off rooms in the studio to cut down on heating costs. It has made me very aware of all the doors in this big old place. There are two doors at the top of the stairs; several hall and closet doors; one storage room has three entrances. Some shut easily and some stick in the jamb. Every door is unique in some way, and really quite beautiful. Great subject for watercolor too! What an artist sees and hears. Wonderful! LOVE the awareness of your surroundings you shared. I just sat and smiled while I watched the video. You made something ordinary - a door - worthy of note.Thanks! I laughed out loud watching the video. Thanks for that. It would make a good start for a horror or mystery movie! 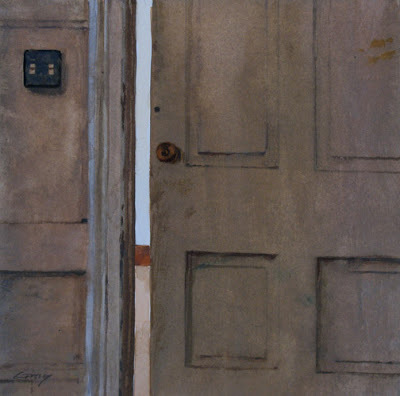 Love the door as a subject for a painting. Wonderful painting. Hi Sheila, thanks so much. Glad you enjoyed it, Pierre--thanks! This one has special significance to me having spent time navigating those studio doors. Definitely brought some drafts of memories and emotions back. Really funny! The Portland video was a nice slice of life too. Keep the odd couples coming and that remarkable lemon has been on the back of my mind since I saw it. Lynne, thanks for your constant encouragement. It was great fun making the video, though anyone who saw me would figure I'd finally lost all the marbles... pacing back and forth, opening and shutting door after door, running up and down the stairs, etc. HA--thanks, Katherine! Yes, doors creaking open or shut really are the stock in trade of scary movies, aren't they? Yes, you share some history with that place too, for sure! There will no doubt be some more odd couples coming, given my odd brain! Nice work my friend. Once again I uttered "Wow" when I saw this. It has an amazing quality that brings the viewer to that place. Even if they've never been there. I kept waiting for John Cleese to come out and say "and now, for something completely different" LOLOL great idea ! Thanks for your thoughts, Bri--I'm glad you like it. Hi Micah--yeah, John Cleese would be perfect! Glad you enjoyed it. Great painting! The door slightly ajar adds a sense of mystery. Makes the viewer want to push the door open. It's spring on Contignac! Loved your video - along the lines of your response to Lynne - I really want to see the video of you making the video. :) And what's up with that one door knob with the dripping...blood? ha ha. Also loved the painting, was recently looking at a Mondrian piece with the rectangles, squares, and colors and noticed some connections as I gazed at your door. Liked how yours works for me as real and abstract. Thanks, Linda. I enjoy your paintings. Hey there, Mark! Glad spring has sprung down there. OMG, could that be dripping blood? Now you're getting ME spooked! Thanks for the perceptive comments. Hope you guys are all well--love to everyone. You are quite the film maker Don. I actally thought with this form of editing, it became very spooky, even scary, because it really caught me off guard.....LOVED IT!!! The funny thing is when I first glanced at this painting I assumed it was a photo of door....then I realized it was a painting! Oops--hi Alvin, didn't mean to leave you out! So glad you like this little movie--I had such fun shooting it and then figuring out how to edit it together. Don, I loved your video. Made me realized that I don't like closing doors. Like something is ending or over. I kept wanting the doors to open and see more of what's on the other side. Very provoking and fun. Terrific! Thanks, Dorothy. I guess the video is a little bit about frustrating expectations--never quite showing the "other side." I'm afraid that's kind of my perverse side. But I like to think it's also a nod to the beauty and power of the mysterious, too. Don: I am just now getting a chance to view the video. it is great! it was full of suspense--don't know if that was planned or not. Would love to see more of these. And the paintings of the doors are terrific. I love your work, what more can I say.